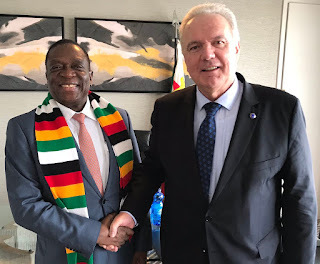 This followed Mnangagwa’s meeting with the EU commissioner for international co-operation and development, Neven Mimica on the sidelines of the African Union summit in Addis Ababa, Ethiopia on Saturday where the two discussed developments in Zimbabwe, including the recent military crackdown on fuel protests, which left 17 dead. Zimbabwe has held disputed elections since 2000 when the ruling Zanu PF party started facing strong opposition from the Morgan Tsvangirai-led MDC. The July 30 polls last year were no different. The disputed elections deepened the economic malaise, while a security crackdown on post-election protests on August 1 last year and another ruthless suppression of demonstrations against fuel price increases of 150% drew comparisons with the dark days of former President Robert Mugabe’s regime. Mimica, who was in Zimbabwe last year, using his official Twitter account on Saturday, announced the meeting with Mnangagwa who is under pressure over his administration’s reaction to the protests. “In the margins of the AU summit, I met with the President of Zimbabwe ED Mnangagwa, a few months after my visit to Harare. We took stock of what has been achieved and agreed that more needs to be done, EU is ready to step up its support if conditions are met,” Mimica wrote. In the EU’s electoral observer mission report, the bloc noted serious gaps that ranged from a poor legal framework to the role of the electoral commission. It also condemned the State’s heavy-handedness in dealing with the January demonstrations, and called on Mnangagwa to investigate the violations and bring the culprits to book. country,” Moyo said on Twitter. Mnangagwa last week missed a Zanu PF “thank you” rally in Mt Darwin and instead reportedly spent the day in office calling African leaders to apprise them about the situation in Harare, according to presidential spokesperson George Charamba. Zimbabwe churches last Thursday sought to broker talks between the government and its opponents hoping to help the country to shake off its divided past over the political and economic crisis. MDC’s Nelson Chamisa attended, while Mnangagwa skipped the meeting. Chamisa had the previous day declined to attend a meeting of presidential election candidates in last year’s poll called by Mnangagwa to agree on an agenda for talks. The opposition leader maintained that he won the July 30, 2018 poll and called Mnangagwa an illegitimate President.